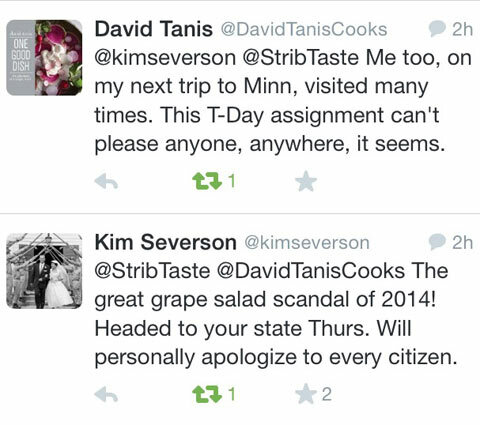 The NY Times listed grape salad as MN's traditional Thanksgiving dish. Minnesotans everywhere: "WTF?" On Tuesday, the New York Times posted its state-by-state nod to traditional Thanksgiving dishes of the 50 states (and D.C. and Puerto Rico). Double apple pie was listed for New York. (Okay, NY and apples—makes sense.) Suzanne Goin’s sourdough stuffing with kale, dates, and turkey sausage was pretty on-point for California. The dish solicited a collective “WTF?” from Minnesotans. Then twitter went crazy with its own hashtags: #embracethegrape and #grapegate. That may have been a bit of hyperbole, but the sentiment reflects the #feelings of Minnesotans at large. Here are a few of our favorite reactions to #grapegate thus far. Sickly and wan, a touch rheumy and thus unable to go to the #NationalBookAwards afterparty, at least I’ve got #grapegate to keep me company.